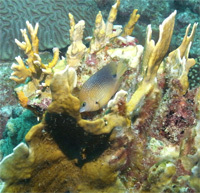 The island of Cozumel is famous for its spectacular drift diving that features dramatic walls and abundant coral reefs. The reefs are inhabited by eels, turtles, toadfish, rays and sharks. Cozumel is known as one of the best diving spots in the world. There are more than 30 dive sites awaiting to be explored. One of my favorite dive destinations because of the variety of dives- breath taking swim-throughs, “flying” drift dives and leisurely drifts. Each dive site is different. Bonaire is located in the southern Caribbean and is part of the “ABC” islands– Aruba, Bonaire & Curacao. Constantly rated as one of the top dive destinations of the world, Bonaire is the dream for every diver. It has over 80 dive sites, many of which are easily accessible by shore, truly making Bonaire the “shore diving capital” of the world. Curacao is an island with a distinct Dutch flavor that has been attracting an increasing number of divers from around the world. Blessed with magnificent reefs, fascinating wrecks, and beautiful corals, Curacao also offers exciting nightlife, casinos and extensive shopping. Roatan and the Bay Islands are a vacation paradise located off the North Coast of Honduras and are home to pristine white sandy beaches, amazing tropical jungle-covered hills, a diverse and unique reef system, heartwarming people, unique cultures and authentic Caribbean charm. Roatan and the Bay Islands are often called the Caribbean’s best-kept secret. Set in the middle of the second largest barrier reef in the world, it is no wonder that Belize is renowned around the globe as world class. Ambergris Cay is the largest most north island in Belize, and the main destination for travelers to this western Caribbean nation. Belize is the home of the famous Blue Hole. Fiji’s soft corals and abundant marine life make the diving her visually spectacular. Framed by huge sea fans and enormous coral heads. This underwater realm is inhabited by white tip reef shards, sea turtles and clown fish- frequently found nestled in colorful soft anemones.